This guide will show you how to create a custom grip for you camera. 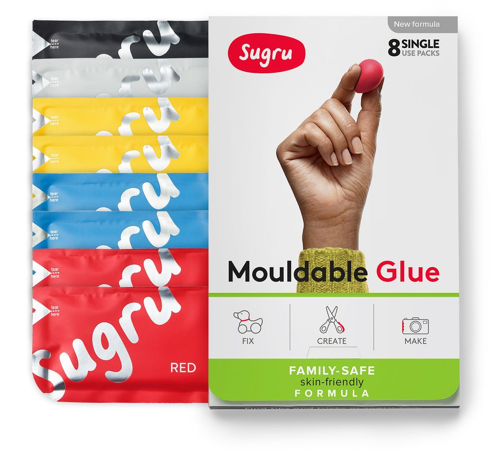 As sugru is a silicone rubber, it feels soft to touch when it has cured, but is also grippy. This makes it perfect for handles and grips as it is comfortable but non-slip. Cameras are very precious and cost a lot of money, so it would be a real shame if you dropped yours. Sugru to the rescue! Understand how you grip your camera and where you need to put sugru. Press the sugru firmly onto the camera ensuring a good bond. Don't worry about the finish yet. Hold your camera and press your grip firmly into the sugru. You might want to gently release your grip and reapply your grip. Gently rub the surface to get a good surface finish. For the next part of your grip, once again press the sugru firmly onto the camera. Sometimes using a bit of soapy water can help to get a better finish. Use the inside of your little finger to get it really smooth. Repeat the previous steps. In addition to this you can also add a custom grip to the bottom of your camera for when taking portrait photographs. Remember to leave to cure overnight. You now have two lovely custom camera grips personalised to your hands, which are easily removable if you ever want to change them. Hint: Make it bouncy with Sugru! Who needs coasters when they have Sugru?